We arrived to the marina in Trogir (near Split airport) in the early afternoon and met up with everyone that evening. We had all assumed that the boat (which included aforementioned breakfast and lunch) would be provisioned with all the basics and we would set sail immediately after some informal introductions. We were a bit surprised to find out that in fact we were responsible for grocery shopping and provisioning the boat. Everyone was quite tired from traveling varying distances to get here and didn’t realize Day 1 of vacation would entail this type of labor. Despite my exhaustion, I tried to take it in stride, and walked the 15-20 minutes to the local grocery store with the mission of provisioning a boat for 8-10 (including Skipper/hostess) for the next week. Not a small undertaking considering it was difficult to navigate a foreign grocery store, convert prices to stay within “budget”, and meet everyone’s dietary needs and preferences. Somehow, a couple hours later we returned to the boat with the basics for breakfast and lunch for the next few days, only to be told that it was too dark to set sail that evening. A rough start to the trip, we all took a taxi boat into the Old Town of Trogir and recovered with a delicious meal and wine at Queen Teuta. We got an early start and headed straight to the “Blue Lagoon” off the island of Drvenik, near Solta. Water here is stunning, like most things, go early in the morning before the crowds and tour boats arrive. We swam around, took some necessary pictures, and had lunch on the boat. Then we set sail to the island of Vis and moored for the night in the town of Komiza. Half of the group decided to book a wine tasting and culinary tour of the island. While I knew I might regret missing the tour, I wanted to walk around the town and get a sense for the Croatian way of life. The narrow, cobblestone streets, and quite beauty of Komiza were unforgettable. We hiked up to a church with views overlooking the small city and felt so lucky to have made this trip a reality. Our Captain had recommended 3 nice restaurants all near each other on the water for dinner. Konoba Bako (make reservation), Konoba Barba, and Jastozera. We decided to go with Jastozera. Pro-tip would be to make a reservation for the table by the grill by the window for the most perfect evening. Known for lobster and grilled seafood/meats. The food was fresh and delicious. Early departure with plan to visit the Blue Cave on the island of Bisevo and then a visit to Stiniva Beach (back on Vis). The Blue Cave was fun and requires a transfer to a smaller boat that can pass under the opening to the cave. Costs about $10pp and they give you just enough time to hear the story of how the cave was discovered and take some pictures. There is no swimming in this cave but I think its worth the trip. One of my favorite places was Stiniva Beach. Again, try to come early before the tour groups. We anchored a bit far from the beach and it was a challenging swim to the land, but worth it to enjoy the stunning landscape of this beach protected by giant cliffs. You can reach the beach by a strenuous, steep hike but most people prefer the sea approach. There is a small restaurant/beach bar and cool views if you go up to the second floor balcony. Next we made our way around to the Town of Vis, where we would be docking for the evening. 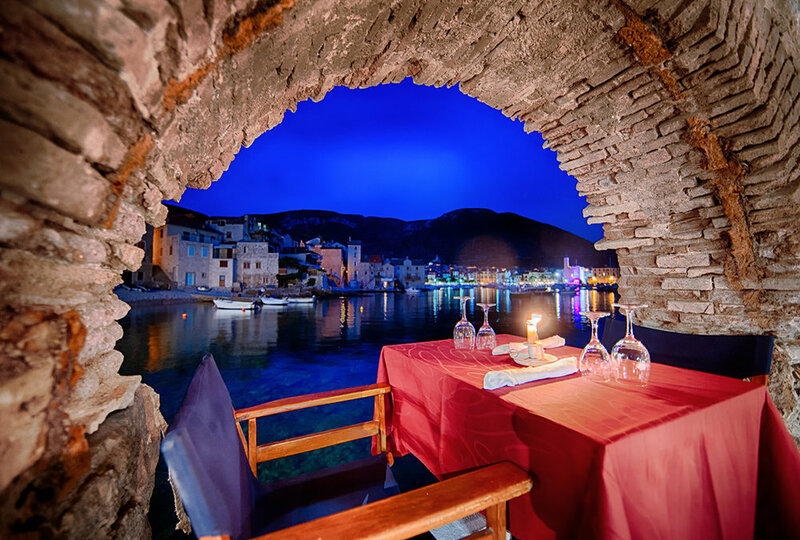 Our captain made us a special reservation at a restaurant the specializes in “peka”, which is usually slow cooked octopus or lamb that sits inside a bell shaped clay dome covered in coals for hours. The restaurant is Konoba Magic Vis and I recommend calling ahead to make a reservation and order your peka in advance. Other restaurant recommendations on Vis include Roki’s, Konoba Senko Restaurant, and Pizzeria Karijola for delicious fresh pizza. The next morning, we sailed towards the Paklinski Islands, an archipelago off the coast of Hvar. Popularly translated as “Hell's Islands”, our captain explained that the islands' extremely “indented” coastlines, with many coves and inslets made it challenging for sailors who could not tell how to pass through or around the islands. This same extreme coastline that makes for challenging sails, now provides many peaceful coves for snorkeling, diving, fishing, and swimming. Don't let the name fool you, these islands are stunning. We spent the morning on land hiking around old, abandoned military bunkers, and climbing up sniper towers for amazing views of the islands. If you’re planning to stop here for lunch or dinner, check out LaGanini Lounge Bar and Fish House. For the evening, we sailed and anchored near the town of Hvar, known for its splashy night life, shopping, and lots of great restaurants. An exciting trip to land that included the engine of our dingy setting on fire, but luckily everyone made it safely. On our way into town we stopped at Hula Hula Beach & Bar (on recommendation from a friend who had been). The scene was a BLAST with a DJ, fun drinks, snacks, and amazing views. The prime time at Hula Hula is later afternoon, early evening and I recommend going for a post-beach, pre-dinner drink (closes at 11pm). Venture a little off the main strip for smaller restaurants tucked into the alleways and enjoy a meal at Konoba Bunar. Then head back towards the marina for a night out you’ll never forget or perhaps never remember. Seven Hvar looked like an unassuming dive bar geared towards an English-speaking clientele and quickly turned into a flame throwing, DJ bumping, dance party. If you’re planning to spend the night in Hvar, I recommend the beautiful Amfora Hvar Grand Beach Resort. Plan for some downtime and recovery for your morning after Hvar, but a trip to Stari Grad is highly warranted (located on the other side of the island of Hvar). Stari Grad is one of the oldest towns in all of Europe. Spend some time walking around the winding streets, people watching, and peeking into the beautiful apartments of the artsy locals. I found my favorite square in Stari Grad, surrounded by picturesque buildings covered in flowers and twinkly lights strung across the square to illuminate the restaurant that occupies the center called La Gitana. We ate one of my favorite meals here. Recommend the cuttlefish risotto, catch of the day, and anything with truffle in it. We spent the next morning in a beautiful cove off the coast of Stari Grad snorkeling and lounging and also making our way to Milna. This is one of the smallest towns we visited but also surprisingly one of the most fun! Our evening started with a special dinner at Restaurant Galicija known for its delicious but affordable meat dishes as well as crazy hot sauces. We split the T-Bone steak and could barely finish the massive cut. My boyfriend was brave enough to try their many hot sauces. Their house made starter hot sauce was delicious and manageable. As the scovilles escalated, they began bringing out hot sauce after hot sauce each time in a smaller bottle with a more frightening name. The final one was called “The Resurrection”, ringing in at 9 million scoville it was presented in an apothecary bottle with an eye dropper and tasted using the tip of a toothpick. Not sure most would survive this one, but if spicy adventures are your things, this place is quite memorable. On our way back to the boat, bellies full of spice, we stumbled upon a seaside party that was spilling into the streets. It felt like the whole town was there dancing and singing along to a live band and enjoying drinks from the bars and stalls that line the coast. This was our last day on the water as we headed back to Trogir. We made sure to go all out enjoying our last time on the boat. Prosecco and champagne were flowing and there was plenty of time for last minute photo shoots and pretend music video performances. We couldn’t believe how the time had passed and the group wanted to focus on maximizing our time together and on the boat. We decided to cook our first dinner on the boat all together and enjoyed a delicious and intimate evening with new friends who had quickly become dear friends through this unforgettable journey. Early this morning we said goodbye to Katarina II and all our sailing buddies. We took a free shuttle back to Split Airport where I had reserved us a rental car for the day. The whole process was inexpensive and easy at this small airport. 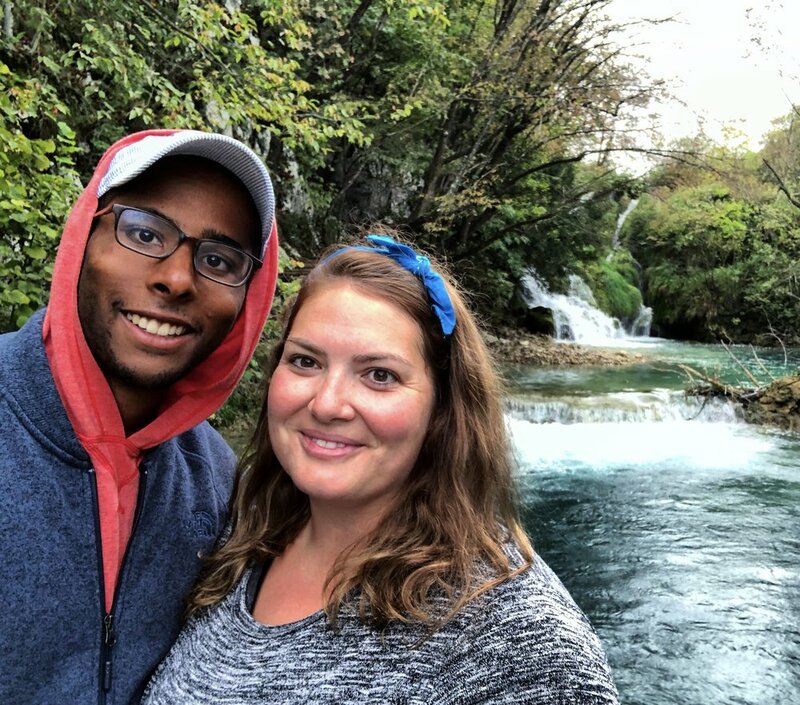 We drove up into the mountains to the Plitvice Lakes National Park (about 2-3hr drive from Split). With 16 lakes and over 90 waterfalls, Plitvice Lakes National Park is breathtakingly beautiful. I recommend starting at Entrance 2 and exploring the upper lakes first, then you have the choice of many hiking trails to make your way down to the lower lakes and Entrance 1. No matter what route you chose you will have some challenging aspects to climb, but take frequent breaks, and feel free to use shuttles, boats, and trams when available to switch up the experience and the views. We made the mistake of starting at Entrance 1 and the park is so large it can take an entire day to cover all of it and see the upper and lower lakes. We walked about 5miles and still only saw a small portion of this beautiful park. It’s truly a special place, unlike any other national park or waterfalls I’ve seen. Our final night in Croatia was spent at a simple hotel near the airport called Hotel Manufaktura. We woke up early, returned the rental car, and made our way home spending our last Kuna on fun souvenirs from the airport. 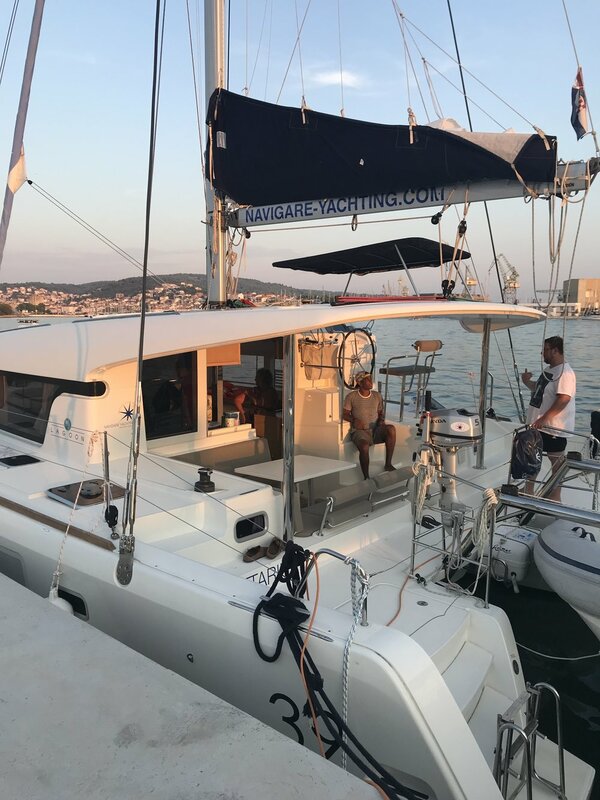 Thank you Croatia, Navigare Yachting, and Globe Sailor for a phenomenal vacation! Dont forget to check out my post on how this whole trip was planned and a link to my plus size packing list.